This 3.7V 680mAh 25C LiPO battery is a replacement battery. It will give more PUNCH and ROBUST performance due to its higher current output and power. Direct replacement battery for syma x5hw x5hc, no modification is needed. • Direct replacement, no modification needed! Real Capacity 3.7V 700~720mAh Lipo battery: Guarantee more flight time,high drain lithium-polymer rechargable battery. Not compatible with Contixo F5. 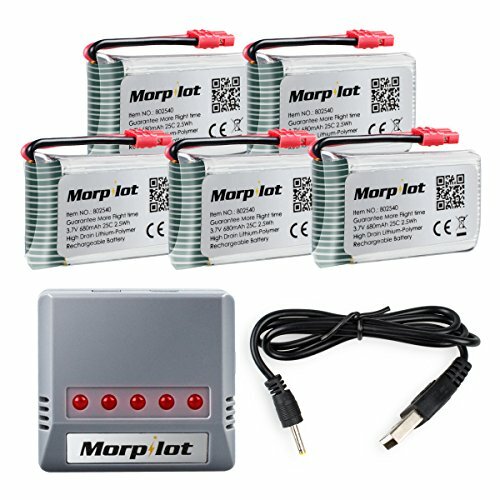 Fast and Intelligent CCCV Mini Powerful Charger: Charge up to 5 packs (3.7V Batteries) at the same time. Only suit for Syma X5HW X5HC RC quadcopter. Cool down the battery before your next flight or recharge. Safety: Deliver powerful output with 4 high performance Mosfets. Intelligent chipset provides overcharge/over disacharge protection. Patented design to avoid crash of your drones. Upgraded ver. high discharge li-po batteries and USB charger cable included.